Casapulla's Serving Delaware's Best Subs & Steaks For over 60 Years !!! Trays custom made. We ask how many people and what type subs you would like. We do the rest ! Having a party?? We can supply the food. How about a 4 or 6 foot sub. Any flavor you like. You may opt to have your sub or steak on a wrap or roll. We do have wheat wraps if you prefer them. Only available in a small ! NOW SERVING HERSHEY'S ICE CREAM !! Luigi Casapulla Was an Italian Immigrant with great vision and an even greater work ethic. Luigi and his wife Anna (Zampini) had nine children. In 1956, He bought a small neighborhood grocery store in Elsmere, DE. Since Lugi was already working two jobs, he had his children help him at the store. About that same time, chain grocery stores were coming to Delaware and Luigi knew he would have to do something to compete. It was then he added Subs and Steaks. Through the years, all nine of their children and all twelve of their grandchildren have worked in the business. In fact, Fifty Years Later, three of their children, Andrew, Louie and Jeanne and seven of their grandchildren are still carrying on the proud tradition. Sadly, Anna died in 1957 and never saw the success of the business. In 1980, Luigi opened his second location in Hockessin DE. Again he had the help of his children and grandchildren. He could be found there everyday until his death in 1985. In 1984, Paula LaPenta (Luigi's granddaughter) and her husband Michael brought the tradition to the southern part of Delaware and opened Casapulla's South. 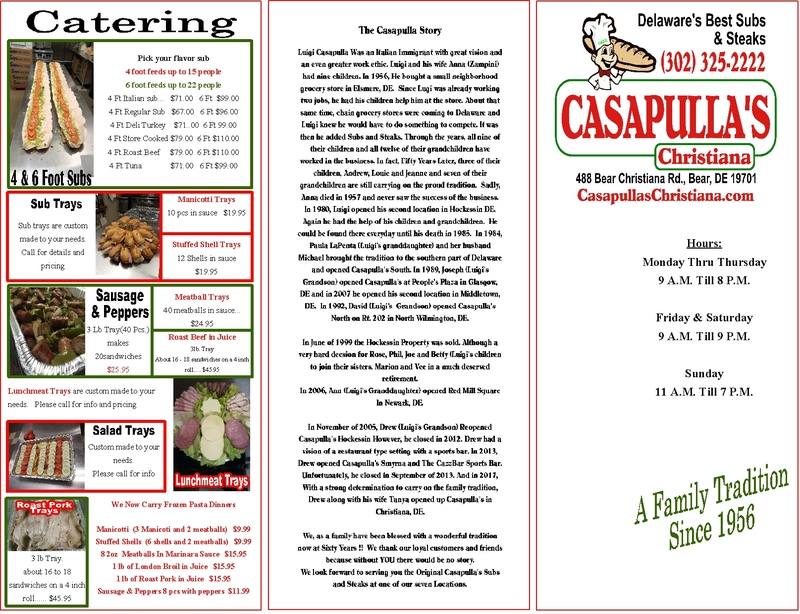 In 1989, Joseph (Luigi's Grandson) opened Casapulla's at People's Plaza in Glasgow, DE and in 2007 he opened his second location in Middletown, DE. In 1992, David (Luigi's Grandson) opened Casapulla's North on Rt. 202 in North Wilmington, DE. In June of 1999 the Hockessin Property was sold. Although a very hard decsion for Rose, Phil, Joe and Betty (Luigi's children to join their sisters, Marion and Vee in a much deserved retirement. In 2006, Ann (Luigi's Granddaughter) opened Red Mill Square In Newark, DE. In November of 2005, Drew (Luigi's Grandson) Reopened Casapulla's Hockessin However, he closed in 2012. He had a vision of a restaurant type setting with a sports bar. In 2013, He then opened Casapulla's Smyrna and The CazzBar Sports Bar. Unfortunately, he closed in September of 2013. And in 2017, With a strong determination to carry on the family tradition, Drew along with his wife Tanya opened up Casapulla's in Christiana, DE. We, as a family have been blessed with a wonderful tradition now at Sixty Years !! We thank our loyal customers and friends because without YOU there would be no story. We look forward to serving you the Original Casapulla's Subs and Steaks at one of our seven Locations. 4 and 6 foot subs. Copyright © 2019 Casapulla's Sub Shop - All Rights Reserved.